The 27th of November is the global day of action to Stop Explosive Investments in cluster munitions, which will coincide with PAX’s launch of the 2014 update on Worldwide Investments in Cluster Munitions: A Shared Responsibility report. Although 115 countries have signed the 2008 international Convention on Cluster Munitions, which bans their use, stockpile and production, multinational corporations continue to attract funding from banks in signatory countries to produce these weapons in countries that have not signed the convention. SafeGround committee member Patricia Garcia taking action against cluster munition investments. 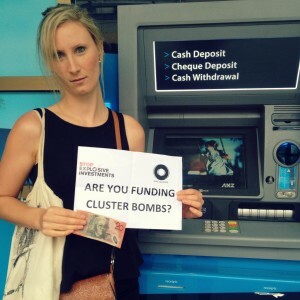 Does your bank fund cluster bombs? Cluster munitions are weapons that contain numerous explosive submunitions which, when fired, saturate large areas of land with hundreds of explosives. It is estimated that up to 30% of munitions fail to detonate on impact, thereby leaving the area contaminated lethal threats to anyone who comes near. Some financial institutions and banks within Australia, a signatory to the Convention, have been implicated in providing financial assistance to cluster munitions producers in other countries, such as Taiwan’s Hua Nan Financial Holdings. On the Global Day of Action, SafeGround and Corner Link will be hosting a snap action in front of the Hua Nan Commercial Bank in Sydney, and will deliver a letter to the bank manager demanding Hua Nan Financial Holdings stop providing loans to ATK (Alliant Techsystems Inc.) to produce cluster munitions. These horrific weapons pose a risk to civilians during attacks as well as long after the conflict has ended. Submunitions that fail detonate continue to kill and injure civilians for decades after the end of the war and many of the victims are children. Cluster munitions are indiscriminate weapons that do distinguish civilians from soldiers. Cluster bombs have been used recently in Afghanistan, Iraq, Libya, Syria and eastern Ukraine. While the Cluster Munition Convention does not specifically ban investments in companies that cluster munition, Article 1(c) prohibits “assistance” in the production of cluster munitions: “Each State Party undertakes never under any circumstances to assist, encourage or induce anyone to engage in any activity prohibited to a State Party under this Convention”. In some countries, “assistance” has been extended to include investments in companies producing cluster munitions. The active choice of investing in offshore cluster bomb production undermines the commitment that signatory countries have made to prohibit these lethal weapons, and breaches their obligations under international law. 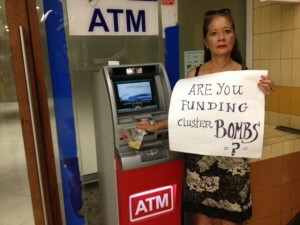 Ask the question: Is your bank funding cluster munitions? To find out more about the status of financial institutions in your country email Suzanne Oosterwiik from PAX at Oosterwijk@paxforpeace.nl for a country specific report.